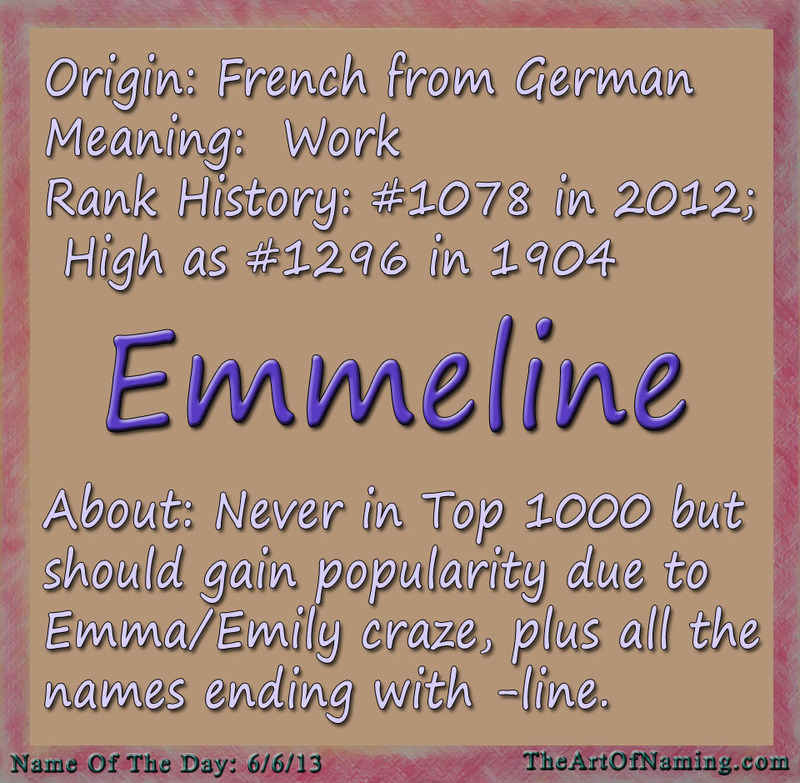 Today's Name of the Day is my new favorite girl's name: Emmeline. As a big fan of Emma (but not of her popularity), Emmeline appeals to me in a big way! Unfortunately, I think many other baby-namers who feel the same way will help to make this name popular soon. It fits in with mega-popular Emma and Emily, as well as all the Madelines, Adelines and Carolines. It's a wonder this name hasn't caught on already! In the real world, actor Christian Bale has a daughter named Emmeline; a famous English suffragette was named Emmeline Pankhurst; and there is an American journalist known as Emmeline Wells. In the fictional world, Emmeline Vance was a character in Harry Potter. There are a couple other examples, such as Brooke Shields' character in "The Blue Lagoon" (1980). 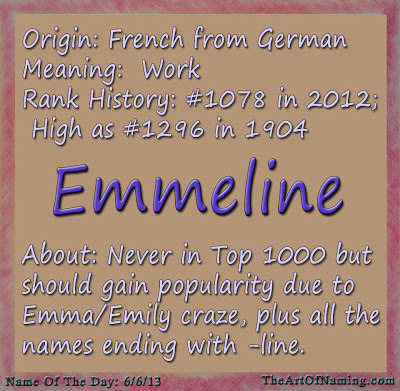 Emmeline is currently sitting just outside of the Top 1000 chart at #1078 in 2012. She has never broken onto the chart, but I think her time is coming soon! She is ranked just slightly higher today than she was in 1904 (#1296). Emmeline massively lost popularity through the 1940's and 1950's before beginning to spike upward again in the 70's. 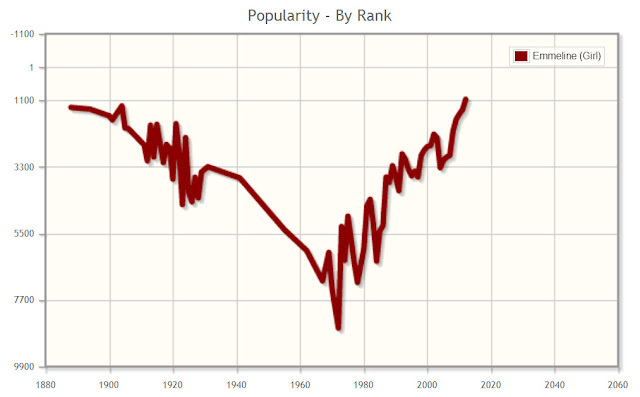 Take a look at this dramatic chart! Emmeline is an Old French form of the Germanic name Amelina, which is a diminutive of other Germanic names that begin with "amal" which means "work". Having a little "hardworker" is adorable! The Normans introduced this name to England. It has always been around, but it has been very under-the-radar for years! What do you think of this lovely name? Would you pronounce it Emme-line or Emme-leen? I go back and forth on that. There is a big debate about which is accurate but it may just come down to personal preference. I lean toward the -leen sound. Would you name your daughter Emmeline?